Kitchen features gas hob, electric oven, microwave, refrigerator, freezer, coffee machine, toaster and water dispenser. Private pool measuring 18m x 4m and 1.8m deep. The swimming pool deck with sun loungers offer a tropical garden feel. Who. Chic travelers and discerning nomads who appreciate good interior design. What. 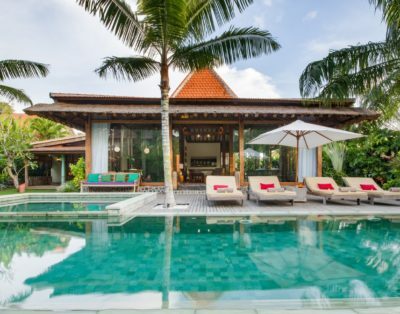 A villa that positively epitomizes the Bali Modern aesthetic, the 5-bedroom Villa A-mar is a stunning place with beautiful interior. 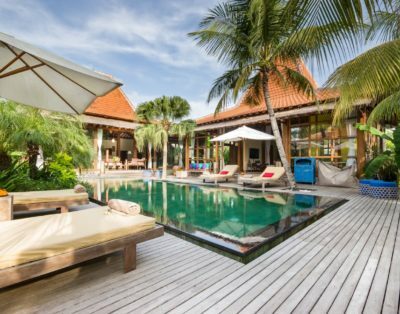 Chic pink and black accents, unfinished walls and tasteful furnishings all take the usual Balinese holiday villa to a whole new level. 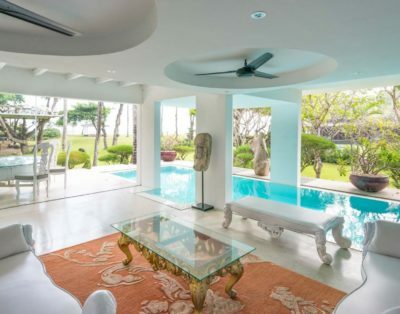 The two-story villa sleeps 10 guests and is perfectly suited for elegant dinner parties and afternoons spent by the 18m pool. With a small staff of housekeepers, gardener-pool boy, onsite supervisor, and security, you’ll have everything you need to run a smooth holiday. Why. The sense of tranquility that you feel when you walk through the doors is unbeatable. Walking distance from the beach, but still far enough away from the touristic hubbub. Rates include welcome drink, WiFi, and services by villa team. Airport transfer service available on request at extra cost. Car and driver rental service on request from approximately USD 60 nett (including petrol) for 8hrs a day only. One (1) baby cot and one (1) high chair are complimentary. Additional baby cot is charged at USD 10 per unit per day and additional high chair is charged at USD 5 per unit per day. Babysitting service available on request at extra cost. Please be informed that Bali island celebrates Nyepi (Silent) Day each year on below dates. The Nyepi (Silent) Day is a day of absolute silence throughout the island and it starts at 6 AM that day and finishes 6 AM the following day. No outdoor activities are allowed and there will be no check-in and check-out from properties on 7 March 2019, 25 March 2020, and 14 March 2021. *Rates are subject to 15.5% tax & service charge. The balance of payment is due 45 days prior to check in. If the balance payment has not received by the due date, Villa reserves the right to cancel the booking and retain the client’s deposit.